Avengers USB Save the Data! Most everyone expected “Marvel’s The Avengers” movie to break records, but which movies would eat the superheroes’ dust? Harry Potter for one! “Harry Potter and the Deathly Hollows 2”, which opened with $169 million, was beaten by “The Avengers” who earned a whopping $207 million on its domestic opening weekend, according to Deadline Hollywood. 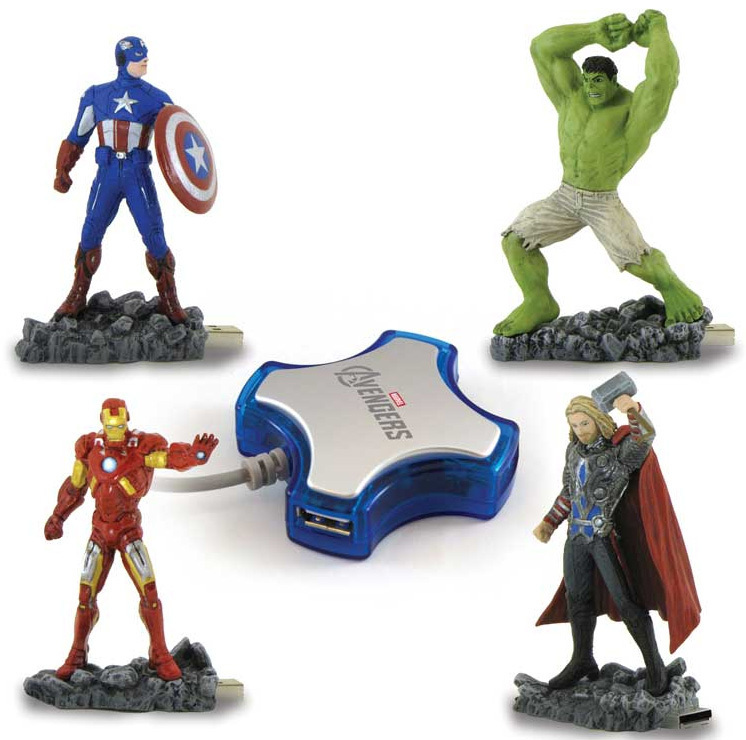 Riding the superb success of “The Avengers,” a timely new set of Marvel USB devices were released that fans all over the world would be more than tempted to collect. Dane-Elec, a global leader in consumer electronics, revealed Marvel’s The Avengers USB drive product line in cooperation with Marvel Entertainment, LLC, creators of the famous superheroes. The Hulk, Thor, Captain America and Iron Man come separately, each with 8-gig capacities. These flash drives are your usual USB, able to store and transport data. They also offer The Avengers 4-Port USB Hub making it possible to stick all four superheroes together to make up a powerful alliance. Avengers Assemble! Age doesn’t matter if you are a Marvel fan, so enjoy these fun to use collectibles. Wouldn’t your workplace be cooler if you had these cool Marvel USBs on your desk? Stark would have used them, he loves self-promotion. Whether for collecting or a fun way to share and keep data, this is a good find at $19.99. Adding the 4-port USB hub is just a little more. Each of the Marvel USBs come with a 5-year warranty. Assemble your own set of Avengers! There is no better team that these four to save your data! This entry was posted in Articles, USB Flash Drives, USB Hub and tagged Avengers USB, cool Marvel USBs, Dane-Elec, Marvel The Avengers USB drive, Marvel USB devices. Bookmark the permalink. One Response to Avengers USB Save the Data!